Long Term Care Insurance can protect your assets from the high cost of needing Long Term Care services such as Home Health Care, Assisted Living and Nursing Homes. With the average cost in Washington of $108,000 per year for a Nursing Home, it would not take many years to spend a large sum or all your assets on care. Traditional health insurance is not designed to cover long term care. Medicare does not cover most long term care costs many Americans may face. And, Medicaid may not cover you until many of your assets have been depleted. Learn more about Long Term Care Insurance with our simple and efficient process which doesn’t require you having an insurance agent come to your home. First, we’ll help you learn how Long Term Care Insurance works and then we’ll guide you through the specific carrier options so you can see if it might be an appropriate tool for your retirement plan. 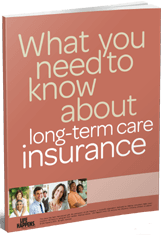 Get Long Term Care Insurance Washington quotes and comparisons of the top carriers. Find the best coverage at the best price. Your Long Term Care Insurance Washington agent will help guide you through your options and answer your questions. Get discounts up to 40% for Spousal, Partner, Significant Other, Preferred Health, Small Business and more. Representing major long term care insurers like Genworth Financial, John Hancock, The State Life, Transamerica, Lincoln MoneyGuard, MassMutual, MedAmerica and Mutual of Omaha. We provide long term care insurance Washington quotes to the cities of Seattle, Spokane, Tacoma, Vancouver, Bellevue, Kent, Everett, Renton, Yakima, Federal Way, Spokane Valley, Bellingham, Kennewick, Auburn and all cities in the State of Washington.